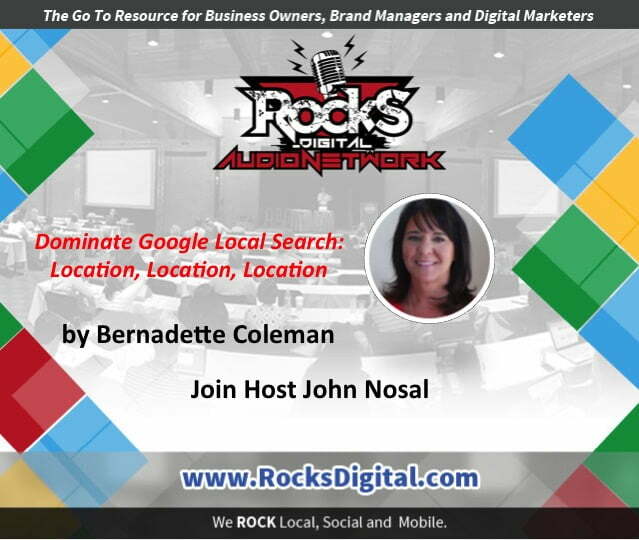 Listen Now on Rocks Digital Audio Network to Bernadette Coleman's content contribution "Dominate Google Local Search: Location, Location, Location" with host John Nosal. Listen Now on Rocks Digital Audio Network to Bernadette Coleman's content contribution "Integrating Social Marketing Across Broader Marketing Efforts" with host Alison Toyne. Listen Now on Rocks Digital Audio Network to Laura Armbruster's content contribution "5 Ways to Create Demand For Your Brand" with host Lissa Duty. Listen Now on Rocks Digital Audio Network to Patty Farmer's content contribution "3 Easy Steps: Taking A Great Idea to Implementation and Income" with host John Nosal. Listen Now on Rocks Digital Audio Network to Bernadette Coleman's content contribution "Six Steps to Optimize Your Content" with host Lissa Duty. Listen Now on Rocks Digital Audio Network to Laura Darkstar's content contribution "Clean Your Plate: Learn How to Delegate" with host John Nosal. Listen Now on Rocks Digital Audio Network to Byron Ingraham’s content contribution "Three Methods to Get More YouTube Views" with host John Nosal. Listen Now on Rocks Digital Audio Network to Natalie Gould’s content contribution "The Secret To Smart Blog Commenting" with host Lissa Duty. Listen Now on Rocks Digital Audio Network to Bernadette Coleman’s content contribution "Digital Marketing On A Budget: Tips From The Great Depression" with host Alison Toyne. Listen Now on Rocks Digital Audio Network to Patrick Dougher’s content contribution "Google Plus Hangouts Puts Social Media On Steroids" with host Lissa Duty. Listen Now on Rocks Digital Audio Network to Natalie Gould’s content contribution "5 Reasons No One is Reading Your Blog" with host Alison Toyne.